KEM Hospital is an institution that describes Vasumathi Sriganesh as “She does not work here, but she is one of us”! 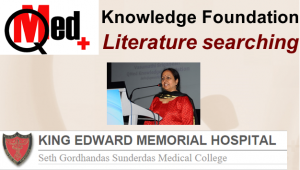 For several years, she has been invited to deliver lectures on literature searching and has conducted full workshops too. On Jan 24, she delivered a lecture for about 35 DNB students from the Maharashtra State. We hope the learning they had the work they do for their thesis becomes easier! This entry was posted in 6 - Old posts and tagged Cochrane Library, PubMed. Bookmark the permalink.